The Phillies have agreed to terms on a three-year deal with Carlos Ruiz for $26 million, according to multiple sources close to the team. The deal includes a $4.5 million club option or $500,000 buyout for 2017 and an additional $500,000 per season if he starts 125 games. A formal announcement may come later this week. 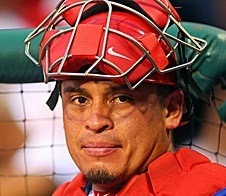 Ruiz, 34, was targeted by several other clubs, including the Red Sox and and Rockies, before settling on a return to Philadelphia. With this deal he now becomes the fourth highest paid catcher in baseball. Ruiz is coming off his least productive offensive season in five years. He opened the year serving a 25-game suspension for using Adderall and spent four weeks on the disabled list in May and June with a hamstring injury. He did, however, hit 298/.360/.465 over his final 31 games. - Patrick Gordon is Managing Editor of the Philadelphia Baseball Review. Follow him on Twitter @Philabaseball.